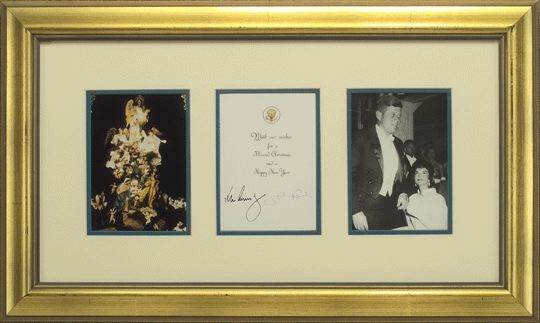 Their Christmas card for 1963, signed by each, “John Kennedy Jacqueline Kennedy” beneath the printed words, “With our wishes for a Blessed Christmas and Happy New Year.” The gold embossed presidential seal appears at the top of the card. The card shows on its front cover the crèche in the East Room of the White House, printed in color. The President and First Lady signed this card shortly before their departure for Dallas. A poignant reminder of the last days of Camelot. Fine condition. 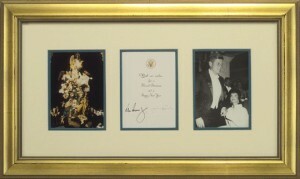 Framed in egg shell, green and antiqued gilt, with a color photo of the White House crèche, and a black and white photograph of Mr. and Mrs. Kennedy in formal attire. Framed dimensions: 23 inches wide by 14 inches high.